Kwaadee always gives the listening public something to talk about with every album. His fourth album, Nsem pii (translated as many matters) addresses scantily clad dressing (Ka wo nan to so), virgins (Fine girl), progress (Yeeko yen nim) and education (P1). 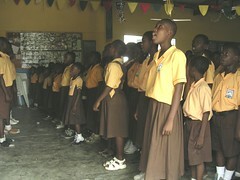 P1 is a theme song for the Asantehene's (Otumfour Osei Tutu) Otumfuo Education fund. He doesn't disappoint with his storytelling and his tag of the 'voice of the streets'. In P1, Kwaadee talks about his educational career, how he didn't take his schooling seriously and how he ends up becoming an armed robber. He doesn't enjoy English and Math and he is in love with street life. He spent his school fees and almost got expelled from school because he did not know the words to the Ghanaian national anthem. Ultimately, he gets to senior secondary school and fails his final exam. Ironically, it turns out that the lawyer who defends him in court for armed robbery is his classmate (from long ago) whom he constantly bullied for his food. Sounds like a true story to me. P1 is part of a bigger campaign - the Otumfuo Education Fund. This fund was set up by the Asantehene to sponsor the education of needy children and it has benefitted several students. There are other funds like it - Cocobod, Ghana Educational Trust (GETFund), etc. Apart from these recognised funds, other Ghanaians sponsor various people to go to school, some of which are their relatives, house maids, neighbours or even strangers. There are a lot of private schools to supplement government efforts but I am afraid the private sector fails the test when it comes to educational funding. The government doesn't have the adequate funding to make education accessible to all, so we must all jump on board in terms of scholarships, etc so that we can educate our whole citizenry. P1 focuses on discipline a lot. This is one issue that must be reviewed and addressed appropriately in our schools. We should not spare the rod and couple good education with even better discipline which should be instilled by the communities and not let the onus fall on the shoulders of the parents. We should not mistake discipline for abuse. Kwaadee's truancy and bad-boy behaviour wrote an unfortunate ending for him and he mentions going back to P1 so that he can make something good out of his life. It's never too late to get educated. There are various schools and institutes in Ghana that offer professional courses. The implementation of the FCUBE (Free Compulsory Universal Basic Education) program allows many more children to attend school as they don't have to pay school fees for primary and junior secondary school. However, there are various hidden costs like Parent-Teacher Association (PTA) dues, supplies, etc that many people cannot afford. AWe need more initiatives like MIT EASE, EACH, NEO Africa's sponsorship program. I am sure you probably thought about the costs involved in sending people to school in Ghana. Whether that is your daily wage, the amount you carry on your debit card or the bounty you expect each year, "ketewa biara nsua" - every little amount counts. In spite of the fact that Ghana's education system has come far and made the nation what it is today, the increasing challenges of the twenty-first century demand that we reengineer our education system to make it more responsive to national goals and aspirations as well as global demands.